What is a valid VAT invoice? Let us break it down for you! What is a valid VAT invoice? If you’re VAT registered, you’ll want to make the most of it by claiming back the VAT on your purchases wherever possible. But, as bookkeepers, we see a lot of our clients missing out because they haven’t submitted a valid VAT invoice. 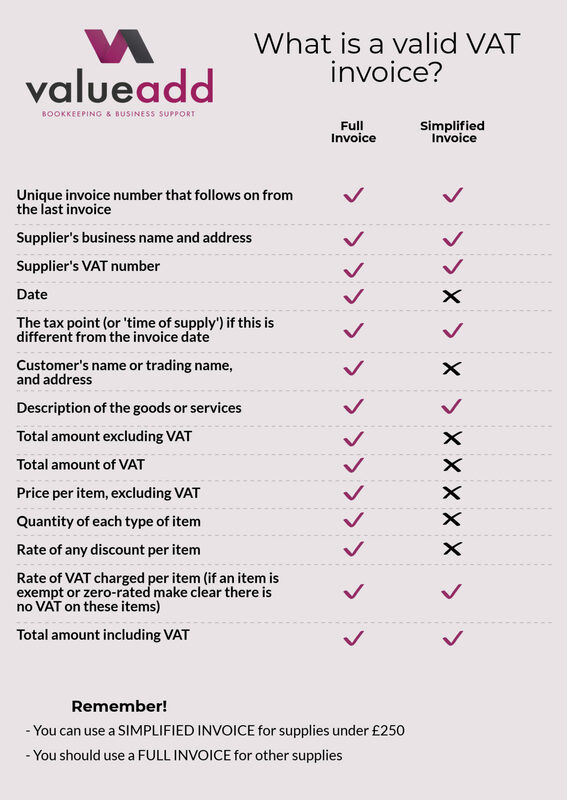 So, just what is a valid VAT invoice? 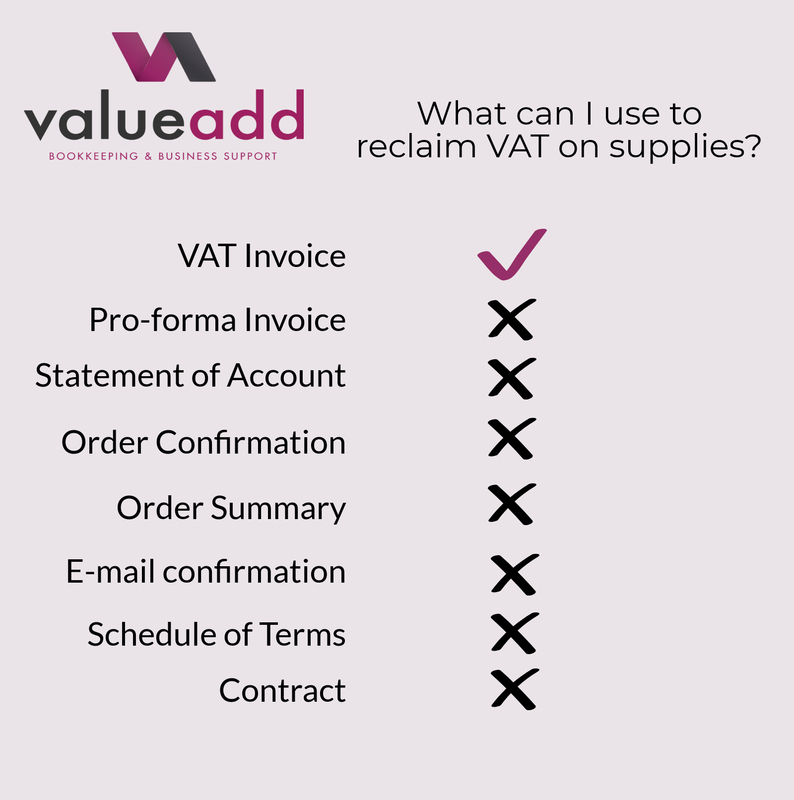 Why do you need a valid VAT invoice? HMRC are pretty strict when it comes to claiming VAT back on purchases. Without a valid VAT invoice, you shouldn’t claim the VAT. If you do, and HMRC query it, you’ll be liable to repay that amount to the taxman. You CANNOT reclaim VAT using a Pro-Forma invoice, order summary, statement or delivery note. Furthermore, deliberate VAT fraud can lead to anything from community service to jail time! What does HMRC consider to be a valid VAT invoice? Ordinarily you’ll use a full VAT invoice for most purchases. We’ve laid out exactly what an invoice needs to show below. There are three different sorts of VAT invoice. Full invoices have the most information on them and they are what you’ll use for most transactions. Simplified invoices have less information on them, and you can use them to reclaim VAT on supplies under 250 (top tip the 250 includes VAT!). The third type of invoice is a modified invoice. This just means that, as long as your customer agrees, the VAT invoice can be issued with VAT inclusive values instead of the VAT exclusive amounts. What if I don’t have a valid VAT invoice? If you can prove to HMRC that the purchase took place, and have appropriate documentary evidence to back up your claim, then HMRC may accept a claim for VAT. You’ll need to show that it was a purchase for your business, show you reasonably checked the supplier and that you made a commercial arrangement with the supplier. All in all, it’s much better practice to ensure that you always obtain and carefully file away VAT invoices. If you didn’t receive one at the point of sale you can always ask your supplier for one later. They should also have a copy for their records anyway! Remember, you have to keep these invoices for 7 years – HMRC will expect to see documentation of your purchases in the event of a VAT inspection. If you’re unsure about VAT invoices, just ask your bookkeeper or accountant. We’re here to help! 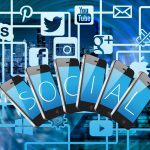 The world of social media is a vast and varied place and it’s become crucial for businesses and organisations to keep up with trends and platforms. But where do you start? Who is the target audience? 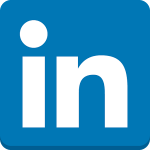 How do you grow your social following and maintain interest? Here are a few things we’ve found beneficial, hope you do too.